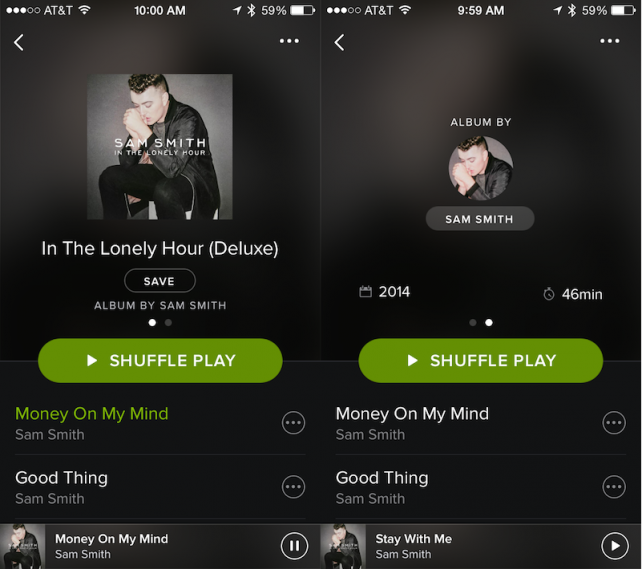 Spotify, the popular Swedish music-streaming startup, on Wednesday refreshed its free iPhone and iPad application with improved music discovery and support for the Ford SYNC AppLink platform. When browsing albums in Spotify for the iPhone and iPod touch, you can now easily check out more releases from the artist in one tap. More importantly, owners of Ford vehicles outfitted with the car maker’s proprietary SYNC AppLink platform can now use Spotify in their car. Spotify says that Your Music, Browse and Radio sections are available on the Ford SYNC AppLink. You can also store your favorite playlists, albums and artists as presets for quick one-tap access during driving. New: While you’re viewing an album on iPhone, check out more releases from the artist in one tap. New: Now you can enjoy Your Music, Browse and Radio on Ford SYNC AppLink. And see those preset numbers on your dashboard? Use them to store your favorite playlists, albums and artists. Fictitious: This app is growing a really fancy beard. A few days ago, the Swedish startup announced video ads on the platform and said it will be giving 30 minutes’ worth of uninterrupted music to anyone who sits through occasional 15-30 second video ads. Spotify’s engaged user base spends on average 146 minutes a day listening to music across multiple desktop and mobile devices, according to an internal company survey. The service counts forty million users, ten million of which are paying ten bucks per month for high-quality ad-free streaming on desktop and mobile. The 35.4-megabyte download is compatible with any iPhone, iPod touch or iPad supported by iOS 6.0 or later.